Alice was playing out in the garden. She really was getting far too big to be playing on the swing; this made her sad as she liked swinging up as high as she could. However, the creaking noises troubled her and her mind turned to whether she could unhinge the whole structure and fall head-first onto the lawn. It struck her as safer to do this as a theoretical calculation than as an experiment. She knew it could be done, but didn't yet know how. “Alice! Come on, we’re going shopping!” bellowed her mother. Oh no... why don’t my parents shop on the internet and have it all delivered? Now that’s what supermarkets are for; otherwise they are just dull-markets. And why is my big brother never around when he could be useful? Alice jumped off the swing and rolled around on the grass, making herself look as unpresentable as possible. “Come on, darling! You know I hate all that traffic later in the day.” Her mother fussed trying to brush off clumps of dried grass from Alice’s dress. That didn’t work! Shopping malls are ghastly plastic places with very little of interest for Alice. She usually tries to head for the computer shops but they are always full of tall smelly teenagers staring at games. “Alice, I know you love to wander off and I’m not wasting my time looking for you. If we get separated I’ll wait for you in this coffee shop. OK?” Alice was not really old enough to be let out on her own, but she was good at wandering off on her own. As she strolled around aimlessly she spotted a huge pyramid made out of cans of some inedible stuff. But what struck her was how people just picked them up in any old order; they didn’t even try to make it into a pretty shape. So Alice set about re-ordering the cans until they looked nice again. That’s called a trapezium, beamed Alice to herself. But people kept coming and ruining her pretty pattern. Maybe what’s inside is delicious. She went back and re-arranged the remaining cans. At this point, a security guard spotted her from afar and slowly made his way towards this strange little girl. He stopped and pondered that the girl wasn’t making a mess; she was tidying up! “Hello, there. Where’s your mother?” said the guard, bending over. Alice hated when adults tried to tell her scare-stories. “That only happens to children!” said Alice, and walked off looking for something else to amuse her. 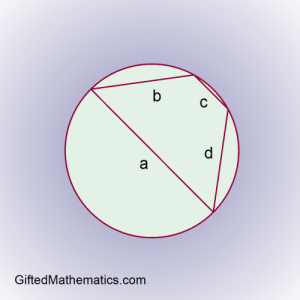 The diagram shows a trapezium (or trapezoid) inscribed within a circle. The sides of the trapezium are of lengths a=25, b=15, c=7 and d=15 units. a) Calculate the area of the trapezium. b) Find another trapezium inscribed within a circle that has integer lengths and the same area as in part (a). The shape must have sides b=d and a>c. The circle need not have the same diameter. You must answer both parts (a) and (b) and show your method. Answers only, without a method, will be rejected. Send your complete solution by email to pmq4cantor@giftedmaths.com. This email address shall be removed after the competition closes to avoid spam. This PMQ3 competition closes on Sunday 3 February at 23:59 GMT. The prizes for this PMQ4 are 3 free places in our Online Classroom for 2 months. The very first correct solution will receive a prize plus two others randomly selected from all the other correct answers. The email time stamp shall determine the order of entries received.